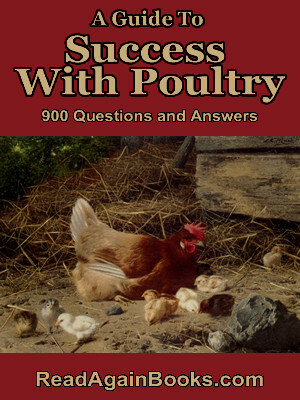 Over 900 Questions and Answers containing Practical Advice on Eggs, Feeding, Chicks, Housing, Diseases, Incubators and Brooders, Turkeys, Ducks and Geese. Why board floors may not be the best flooring for your poultry housing. The length of time a healthy chick will normally take to emerge from its shell after it is pipped, and whether or not you should help a struggling hatching chick. How soon after mating the breeding birds the eggs will prove fertile. A recipe for Whitewash which can be used to cover the inside and outside of your poultry housing. The effect unfertile eggs in the incubator will have during a hatch. Remedies to aid in curing chicks of diarrhoea. A simple old fashioned recipe that can be used in the treatment in cholera and similar diseases. Methods for preventing and removing lice. How very small chicks can best be resuscitated when they have been caught out of the brooder in a heavy rain and are wet and chilled to the point where they are apparently dead. The beginner and amateur poultry keeper will find a wealth of valuable information within this classic poultry raising guide that can be referred to time and time again. File Size : 910kb approx.